Forum 2013 – Thank you! 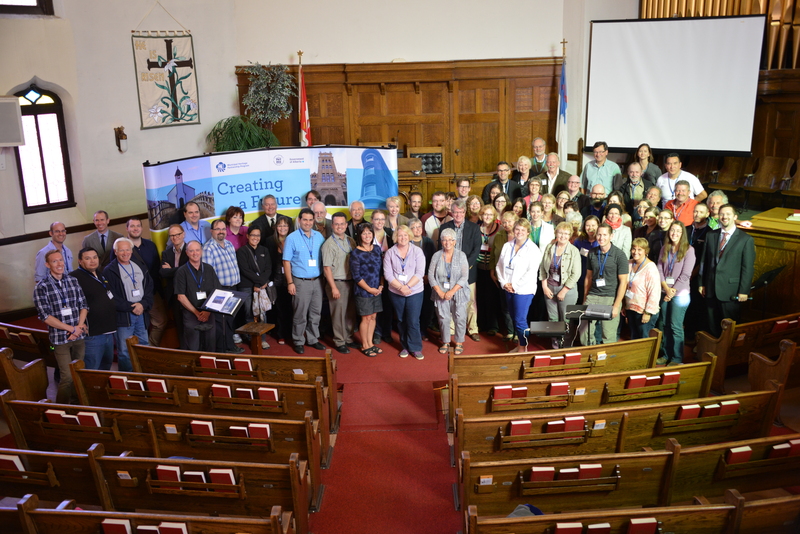 Participants in the 7th Annual Municipal Heritage Forum, gathered at Knox Church in Old Strathcona, September 20th, 2013. Your contribution really helped to make the 7th Annual Municipal Heritage Forum a very positive event. We couldn’t have done it without you all! Whether you were presenting or just there to connect and share your local knowledge and experience, it all made a big difference. You should see some of the great content from “The ABCs of Conservation,” including HD video of some of the Forum presentations, featured here on RETROactive over the next few weeks. See you next year at Forum 2014! 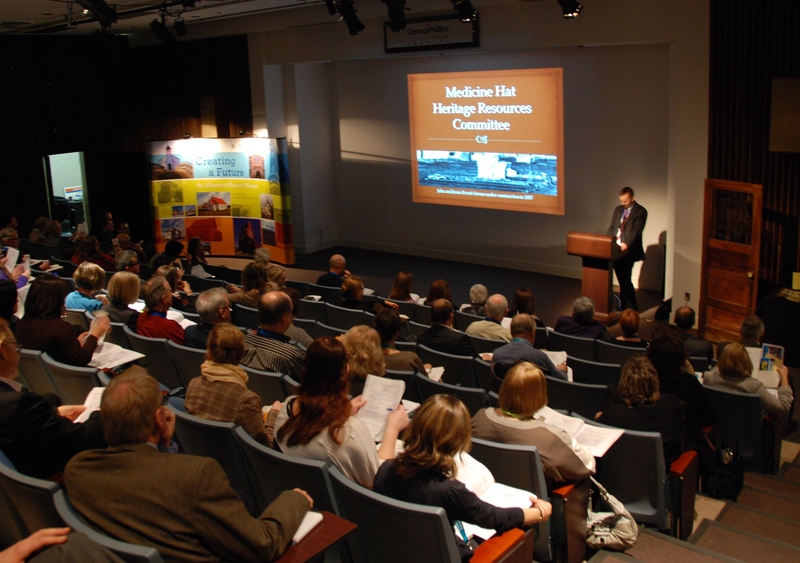 The Alberta Historical Resources Foundation board of directors has a few openings. We are accepting applications from people interested in joining the Alberta Historical Resources Foundation‘s board of directors. acting as an appeal body for certain decisions made in Alberta Culture. Members are appointed for terms of up to three years. The board meets four times per year for about a day and a half per meeting at locations around the province. Board members are also occasionally asked to attend events within the heritage community. Interested individuals can submit their applications through the Government of Alberta Careers website. The posting number is 1019525. The competition closes on October 3, 2013. Should you have any questions about the board positions, please contact Matthew Wangler, Executive Director of the Alberta Historical Resources Foundation. Mr. Wangler can be reached at 780-438-8503 (toll-free by first dialing 310-0000) or matthew.wangler@gov.ab.ca. We look forward to hearing from you. 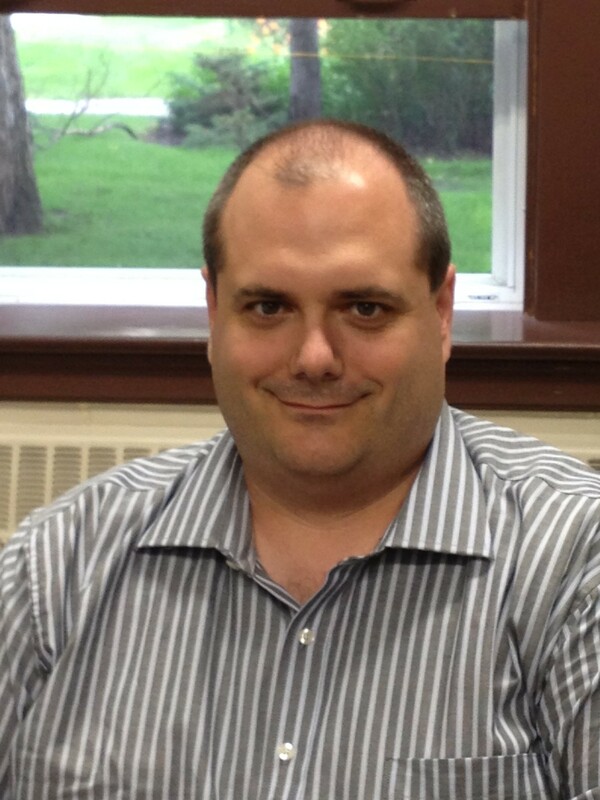 My name is Allan Rowe, and I am the new Historic Places Research Officer. Following the example set by my colleagues, I’m taking a moment to introduce myself. I am originally from British Columbia, born in White Rock and raised in the beautiful Okanagan Valley. Halfway through my grade twelve year, I made the fateful decision to change my upcoming college major from computer information systems to history, and I haven’t looked back. I completed my BA in history at the University of British Columbia in 1994, and followed up with a Public History Diploma at Simon Fraser University. It was during that time that I got my first taste of heritage work as a summer student at a small British Columbian museum. In my case, it was the Elphinstone Pioneer Museum (now the Sunshine Coast Museum and Archives) where I spent the summer of 1996 answering tourists’ questions about The Beachcombers (we were located just up the road from Molly’s Reach – apparently The Beachcombers was a huge hit in Japan). Unable to find permanent work in the heritage sector, I spent two tedious years working in corporate cell phone distribution (ugh), until the muse of history called me back to service and I received my MA in Canadian History from SFU in 2000. I then moved to Edmonton to pursue my Ph.D. at the University of Alberta, and during my time as a graduate student, I was fortunate enough to work with Historic Places Stewardship on several occasions, mostly working on heritage markers and assisting with the Alberta Heritage Survey Program. I finished my Ph.D. in history in 2008 and taught Canadian, Irish and American history, most recently at Keyano College in Fort McMurray. Though I enjoyed my time as a history instructor, I have always been fascinated by the heritage sector, and I was thrilled when I was given the opportunity to join the Historic Places Stewardship team in Edmonton. On the personal side of things, I am blessed with a great wife and three amazing daughters, whose own interests range from bird-watching to dog-sledding to Shakespeare. I enjoy cooking (with mixed success) and continuing to learn as much history as possible. I remain a staunch Vancouver Canucks fan, and I welcome everyone’s scorn and derision. I’m excited to join the team and I look forward to meeting everyone in person. The Municipal Heritage Forum 2013 begins in a few days! We just finalized the agenda. Here, hot off the (electronic) press, is the event program and a list of the breakout sessions offered. Please be green and don’t print these documents if you’re attending the forum. We’ll provide you with copies of each when you register. Matthew, Val and I look forward to seeing many of you on Thursday and Friday. And, if you can’t attend, don’t fret, We’ll recap the highlights on the blog over the next several weeks. Want to attend Forum 2013? Register NOW before it’s too late! 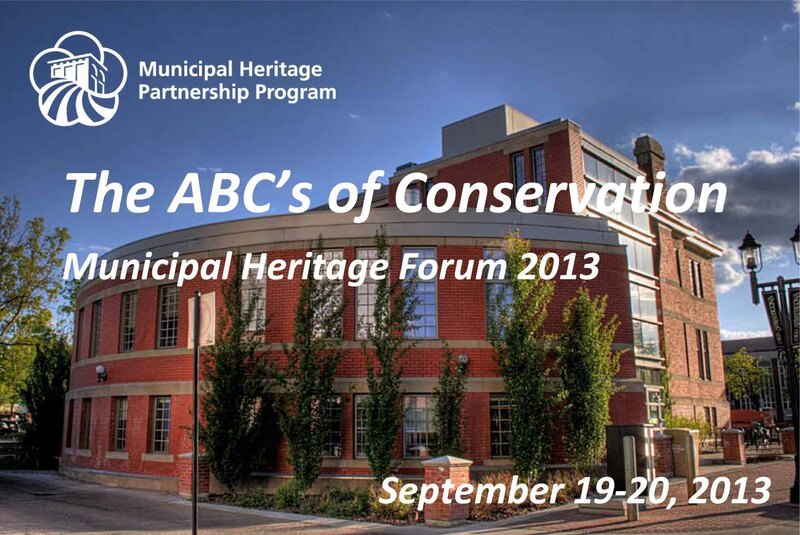 We are thrilled at the eager response to our upcoming Municipal Heritage Forum – the “ABC’s of Conservation,” taking place September 19-20th. That’s two weeks away! It’s going to be a great time of learning, inspiration, and fun. Registrations have been pouring in, and there are limited spaces remaining. Be sure to register online ASAP to reserve your place! The Forum is free of charge to all attendees. Registration will close September 12th, or before if we reach our capacity. Forum participants are invited to attend the Alberta Museums Association’s Opening Reception, Thursday evening,September 19th. Tickets (for the reception only) are $40 each and can be purchased here. Has your community been involved in some really compelling heritage work this year? Is there a conservation project you are eager to share with others? Back by popular demand, this year will feature our community “show and tell” sessions on both Thursday September 19th at the Ukrainian Cultural Heritage Village and Friday September 20th at Knox Church in Old Strathcona. While we have already lined up some excellent updates from communities, we do have room for a few more, and would like to give you this opportunity to get involved and showcase your community’s good work. Accompanied a few slides or images – a picture’s worth a 1000 words! About a heritage project undertaken within the last year – it can be completed, or a work-in-progress. If you are interested in “showing and telling,” your heritage happenings, contact Matthew Francis at matthew.francis@gov.ab.ca or (780) 438-8502, toll-free by first dialing 310-0000.